- bookings made after 5pm for the same day of arrival will not be accepted. I had a great stay and the most comfortable bed ever!! The hostel is a perfect place to relax and recharge your batteries (and phone) after a long day hiking. You can also leave your bags there before check-in or after checkout if you need. It is right next to the ancient monastery and very close to the visitor centre (with bus stop) as well. Clean, warm with very friendly staff. Location ideal for exploring. I had a great stay here! Staff were super helpful and friendly (and helped when I was feeling unwell). It’s a short walk from the main street but it’s just nestled beautifully amongst the trees. Wifi didn’t reach the room but there were large communal areas. Great location. Only downside weather very mild for our stay and we could not adjust the heating in the room which was very warm. 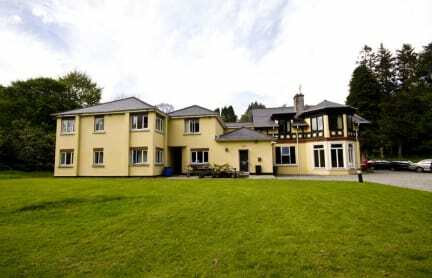 Great hostel right next to Glendalough national park. Clean and comfortable. Moderately social. No alcohol in the hostel but there is a pub Dow the street. The toilet was was not very clean (private room) it smelled really bad (maybe from the pipes or something) and the green light made the room bright all the time at night. Bed's werent the most comfy, water in the shower was barely warm and internet is stone age slow, basically just doing the bare minimum. The drawcard is the location which is in the heart of Glendalough. Use this as a base for your hiking adventures and that only.